Although the boom times of tablets are over, the large devices are still widely used. But the iPad is making life difficult for Android manufacturers, at the latest since the cheapest Apple tablet has only cost around $330. The new Galaxy Tab A 10.5 from Samsung is in the same price range. We've had a chance to try it out, and present to you our first impressions. The Galaxy Tab A 10.5 is available with and without LTE modem. If you can do without the possibility to use a SIM card, you pay 329 Euros (about $385), with mobile phone is 389 Euros (around $455). Middle class in terms of price, although the sale price may not be an accurate conversion. By comparison, the Apple iPad starts at $329. At the launch of the Galaxy Tab A 10.5 there will probably also be bundle offers, but these are a matter for the dealers and unlike the Galaxy Tab S4, they are not set globally by Samsung. As an accessory Samsung offers a book cover for 59,99 Euros (around $70), but without keyboard. The charging dock is identical for both new Samsung tablets and costs 59.90 Euros (around $69). The Galaxy Tab A 10.5 goes on sale August 24. A tablet must be slim, but should not appear too fragile. Samsung split the difference well . The Galaxy Tab A 10.5 measures 8 millimeters at the thickest point and weighs 550 grams. The corners and edges are rounded and ensure that the tablet rests well in the hand. The workmanship and material may not look particularly fancy, but they are practical. The rubberized back of the Galaxy Tab A 10.5 has an advantage and a disadvantage. On the credit side it says that the tablet is so comfortable to hold and does not slip even on smooth surfaces. Less nice: The Galaxy Tab A 10.5 gets dirty very quickly, and this is already noticeable with the black version. The white tablet should become unsightly very quickly. Samsung builds great displays, at least for expensive high-end devices. The Korean manufacturer's Super AMOLED panels are rightly regarded as the benchmark for smartphones and tablets. Especially in the size of a tablet these are quite expensive, and therefore the Galaxy Tab A 105 has to do without AMOLED and instead makes do with a TFT display. But even without AMOLED technology, the display of the Galaxy Tab A 10.5 is beautiful to look at. The 10.5 inch screen, which measures 1,920 x 1,200 pixels, shows beautiful colors and has good brightness, but does not quite come close to a good AMOLED panel in terms of contrast and viewing angle stability. But that's a bit too much in the price range. Overall it's still a good display. Samsung ships the Galaxy Tab A 10.5 with Android 8 Oreo. There is no schedule or promise for the update to Android P yet. The Samsung Experience has a lot of its own functions and apps to offer, which certainly not every user needs, but they're available. If you don't like the Samsung interface, you should install an alternative launcher. The software includes the new Daily Board feature that displays time, weather and a photo slideshow on the tablet display when it's in the dock. Bixby Vision also supports the Galaxy Tab A 10.5, as well as the new children's mode. However, customers have to do without DeX and SmartThings. Like the Galaxy Tab S4, the Galaxy Tab A 10.5 uses a Qualcomm processor instead of an Exynos chip. The Snapdragon 450 and its 3 GB RAM are enough for a quite fast performance, but the new Samsung tablet is no powerhouse . Data is stored in the internal memory of 32 GB or on a microSD card of up to 400 GB. The mobile version of Galaxy Tab A 10.5 offers LTE Cat 6. The Galaxy Tab A 10.5 has four speakers in the corners that make a lot of noise. Thanks to Dolby Atmos, the sound can be adapted to different conditions if desired. In contrast to the Galaxy Tab S4, however, AKG has not taken over the tuning. The Galaxy Tab A 10.5 is really well suited for everything that needs sound . As befits, the Galaxy Tab A 10.5 has two cameras on board, a selfie-cam with 5MP and an 8MP main camera. This is enough for one or two snapshots and of course for video communication, but not for much more. Miracles are not to be expected . The Galaxy Tab A 10.5 should be able to play 14.5 hours of video with one battery charge. With the capacity of 7.300 mAh this figure does not appear to be pulled out of the air, but of course we still have to test it in our review. In any case, the battery is strong . Charging is done either via the USB C port or the pogo pins on the long side of the docking station. Apple scored a real hit with the affordable iPad, and there are doubts whether the Galaxy Tab A 10.5 can keep up. But not everyone wants an iOS device, and in the Android segment the new Samsung tablet is quite competitive. 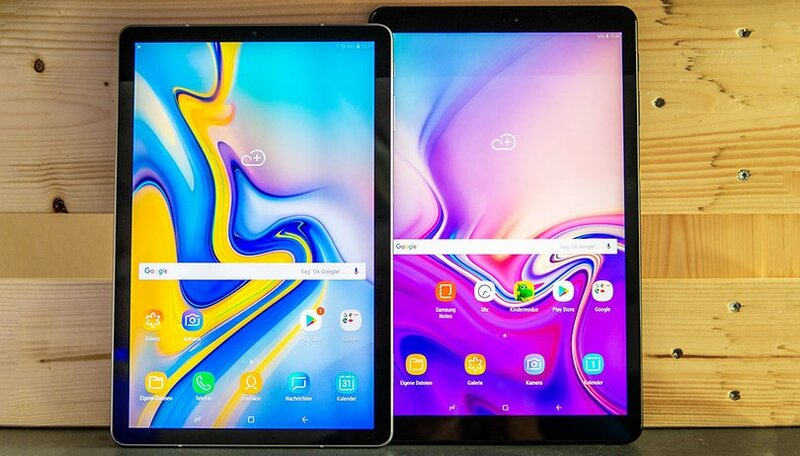 Sound and display stand out from the pleasing overall package; the battery could also prove to be the trump card once we complete the Galaxy Tab A 10.5 review. I'm trying to find a good tablet with writing and note taking in mind. Any news on a release of a 10.5 version with S-pen? I have the last version of this tablet with the s pen. I love the rectangular shape vs the square is much better for watching movies. just hope this one comes with an s pen version.